﻿The National Register of Historic Places is the official list of the Nation's historic places worthy of preservation. Authorized by the National Historic Preservation Act of 1966, the National Park Service's National Register of Historic Places is part of a national program to coordinate and support public and private efforts to identify, evaluate, and protect America's historic and archeological resources. More than thirty places in Winnebago County are on the National Register. Below are a few of them. The Romanesque Revival Style commercial structure was completed in 1892. The Roman arched windows, horizontal belt courses and the rounded turrets identify it as Romanesque Revival. It honors Judge William Brown, a pioneer of Rockford. Born in England in 1819, Brown came to the US in 1827. He grew up in the state of New York. There he studied law in Rome, NY, and passed the bar. He then came to Rockford in 1846. He was elected Justice of the Peace in 1847. This began a long and distinguished career as an elected official. He served as District State's Attorney for Winnebago Co., judge, Mayor of Rockford, and three-term-plus state legislator.Brown died in 1891; the building was finished just after his death and was named in his honor. The building currently serves both as a residential and commercial site. Photographer unknown. Jonathon Peacock started his brewery in this home. A Greek Revival native limestone house with gable front roof, stone lintels and sills, fan-shaped transom above the door with an arched overhang. The brewery complex is situated along the east side of Rock River on North Madison Street on 2.25 acres of riverfront property. The ten buildings in the complex are on the National Register of Historic Places. Photo by CJFOX, 2013. 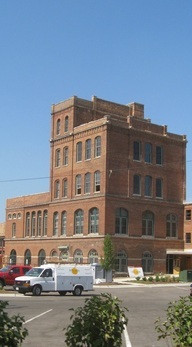 The most distinguishable building in the Peacock Brewery complex is the Romanesque Revival Brew House. The rounded Roman arches and the asymmetrical configuration of the windows were characteristic of Romanesque Revival which started in the 1840s and 1850s on the east coast. The influence of "modernism" and Chicago architecture can be seen in the sleeker. less ornate structure of the building with no turrets or rounded conical roofs. However, the dominance of the Roman arch at the windows and the horizontal stone belt course still proclaims its Romanesque Revival roots. Soldiers and Sailors Memorial Hall, Rockford, IL. Also known as Memorial Hall, this classic Greek Revival building is faced with Bedford, Indiana limestone, some of the most beautiful limestone in the country. ﻿Memorial Hall contains one of the best collections of Civil War and military memorabilia in the country. As a memorial to soldiers and sailors and now all fighting forces, it was the first of its kind in the country when it was dedicated by Theodore Roosevelt in 1903. East Side Center. Rockford, IL. 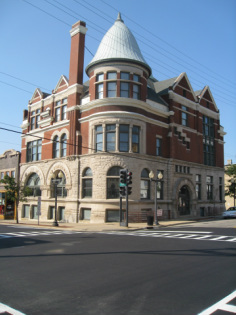 This building is the landmark YMCA built in 1889, now called the East Side Center. Built by subscription, the building was Rockford's first YMCA but was sold in 1906 and was the East Side Inn until it closed in 1968. The Richardsonian Romanesque style building was renovated and now serves as an office building. Photo by CJFox, 2014. Built in 1887, Garrison School is named for Thomas Garrison (1812-1871). Mr. Garrison came to Rockford in 1853. He bought a farm on the west side and built a beautiful mansion on the property --749 John Street--the house was destroyed by fire in 1868. Garrison School was built on what was originally part of the Garrison farm. 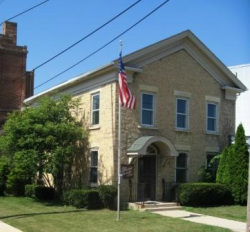 Garrison School served many generations of children in Rockford; it closed as a school in 1987 but continued in a number of other capacities: cinema, art museum, dance school, preschool, teacher center and others. The building was renovated in 2012 and now serves as Garrison Lofts and Townhouses. Photo by CJFOX, 2012. Tinker Swiss Cottage is probably the best known historic structure in the city. It was built beginning in 1865 by Robert Tinker. Tinker had toured Europe in 1863 and fell in love with the architecture of Switzerland and the Swiss Cottages. The cottage is built on a limestone cliff overlooking Kent Creek. At the time, it also overlooked the John H. Manny estate. Tinker eventually married Mary Dorr Manny, widow of John H. Manny who had invented a reaper that rivaled, if not out rivaled, the famous McCormick Reaper. After successfully demonstrating the high capability of his reaper in a number of contests, both in the United States and in Europe, Manny was sued by Cyrus McCormick for patent infringement. The lawsuit failed and the verdict was upheld all the way to the Supreme Court, but Manny was exhausted and died two weeks after the last trial from tuberculosis. His widow took over the reins and ran the company successfully for a number of years. She hired Tinker as her clerk. When they married, they lived in both the Manny Mansion and the Swiss Cottage. The family owned and lived in the cottage for over 75 years. Incidentally, John Manny hired a young lawyer from Springfield, IL, Abraham Lincoln, as one of his four counselors in the reaper trial.